The previous desert trip had been focused around a climb of Old Woman Statue in the Old Woman Mountains, so it was somewhat unusual to be returning to the same range on this next trip. Though not a main focus, there was a remaining P1K in the southern part of the range that I was keen to visit and duly conspired to make it part of this longer trip. It certainly seemed like a different range since we approached it from the opposite side, to the south from SR62. With Michael joining us, we'd be able to use his very capable Nissan Pathfinder to drive the rough road to the trailhead we planned to use. He met up with us at our campsite at the junction of SR62 and Cadiz Rd sometime in the night, and shortly after 6a we were packed into his vehicle and heading northwest on Cadiz Rd. After 14mi we turned right onto a powerline road and drove another 6mi to the rougher unmarked road that would take us into the wilderness. It is very hard to spot and you pretty much have to know where to find it to have any chance of using it. The road conveniently heads an additional 4mi into the Wilderness, or rather along a "cherry stem" that is cut into the Wilderness boundary to allow just such usage. We spent almost an hour in driving the 24mi, getting us within 2mi of our summit. Starting from the Wilderness boundary, we headed roughly southwest across the desert, flat at first and up a wash as we went over a low saddle to the next major drainage to the south. Cutting across the grain (which means going in and out of a number of washes), we traversed the width of the wide wash system to reach the base of Peak 3,763ft, our P1K. The first 3/4 of the climb were rather of the usual class 2 variety with little scrambling. The upper section was another story as we found the direct ridgeline becoming untenable. Michael and I moved off onto the north side of the ridgeline, finding a surprisingly fun route that weaved in and out through the ridge with some tricky route-finding and good scrambling, pulling ourselves onto the highpoint just after 9a. Iris and Scott were another 15min behind us, choosing an alternate route off to the south side of the ridge that they seemed to find enjoyable. John Vitz had left a register (no surprise there, P1Ks seem to be his specialty) in 2004, ours making the only other entry. After some rest, it was not hard to talk the others into an alternate descent, one that would take us on a nice traverse to Kilbeck BM, half a mile to the northwest and less than 10ft lower. There was some good class 3 in getting off Peak 3,763ft along a thin ridgeline, then easier travel to Kilbeck BM which we reached just after 10a. On that previous desert trip we had visited the Kilbeck Hills HP, a lowly set of hills about 7.5mi to the southwest across Cadiz Valley. Kilbeck appears to be an alternate name for Chubbuck, a nearby railroad stop along the line that parallels Cadiz Rd. Mark Adrian and Richard Carey had left a register here in 1996. Vitz left his signature here, along with a comment pointing out the higher point to the southeast we'd just come from. We added our own entry before starting back down. We descended to the east, initially following a ridgeline that proved a bit too undulating. Ahead of the others who were no longer in sight, I decided to drop northeast into the wash on that side where I could see a sand/gravel bottom that looked more inviting than the ridgeline I was following. This worked nicely once I had descended the steep slopes to reach the bottom, the others still nowhere to be seen above or behind me. I followed the wash down past a random BLM survey marker next to a steel pipe that drains a small catchment built into the wash, now filled with gravel and sand. Some bighorn sheep bones added some interest as I continued down the drainage. Peak 2,148ft caught my attention as I wound through the bottom of the wash, and as it was only a quarter mile from the car, I thought I might be able to climb it and get back down before the others caught up with me. It was a quick little bonus summit that took about 10min up and another 5min down, but the others were back to the car before I could reach it - seems they weren't so far behind me as I'd thought. 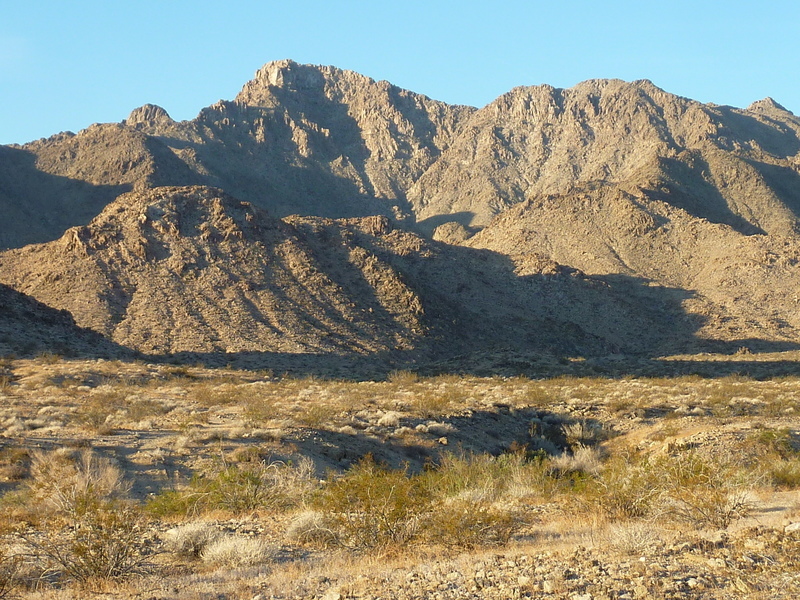 This tiny range is really just a lone ridgeline sticking up from the desert but has some quite interesting rock and looks impressive from a distance, especially from the north. Finishing the previous hike just after noon, we took more than an hour and a half to retrieve our vehicles, drive them some 5mi further east, abandon them again at Rice (itself and abandoned waystop), and drive together in Michael's Car south to the Arica Mtns. Significant mining operations have left roads scattered about and make this one almost a drive up. We were easily able to drive up to the saddle separating the south and north sections of the range, less than a quarter mile from the lower southern summit that we tackled first as a bonus peak. This was a straightforward climb of stiff class 2 (some loose sections of steep choss makes it modestly tricky), taking about 15min. We found a dilapidated survey tower but no register, so we left one while idling there to take in the views. Returning back to the car before the others, Scott and I decided to start hiking back up the road to the north rather than wait for a ride. Michael and Iris came driving up just as we started to leave the road. The hike was about twice as long as the last, but still less than 30min to the summit. There was some mildly interesting limestone scrambling along the way but it looked better from a distance than it proved to be once we were on it. There are two closely-spaced summits to the range highpoint, the southern of the two the one we naturally came to first. It had a Gordon/Barbara register from 1992 which made us figure it was the highest. Upon reading the other entries from Vitz and Carey, it seems that leveling instruments show the northern point to be slightly higher. It looked to be a bit more difficult and after noting that Carey and Adrian had each been to the summit three times, seems it might require more than one effort to reach. This northern summit turned out to have the best scrambling of the day. We dropped a bit off the west side of the ridge during the traverse to make easy work of reaching the low point between the two. Here's where things get interesting. I first investigated going along the ridgeline directly from the low point. This proved a dicey proposition with a loose vertical section to start that I dared not attempt. Back down on the west side, I then explored a limestone face, steep, but with solid rock and ample holds. The others watched from below but did not like the looks of it - later they would comment that it was the downclimb they were worried about most. I would put it at the easy end of Sierra class 4. The route was a quick way to reach the north summit from the south and I was soon at the top while the others continued around the west side to look for a way more to their liking. I found another register here, but only one entry from Mark Adrian who'd left it in 2014. He mentioned coming via the N. Arete, so I went off in that direction to see if I could help discover a way for the others to join me. There was a fine knife-edge ridge to dance along (ok, not exactly knife-edged, but pretty nifty still) to start, then a short section of somewhat crappy class 3 (due to looseness) that proved to be the crux. I met the others at the long end of the N. Arete where they could climb back up to the ridgeline and together we all returned to the higher summit. After returning back over the N. Arete once again, we chose a looping return to avoid having to traverse the crest and go back over the lower south summit. Nothing special on this part, just some steep talus to descend at first, then easier travel in the drainage. Distracted, I went well past the point of leaving the drainage to return to the car and was made aware of this only when Scott pointed it out. It was nearly 4:30p by the time we had all returned to the car, making for a rather full day. The sun had already set and the moon would rise as we were driving back out to the Rice-Midland Rd we'd taken from SR62.